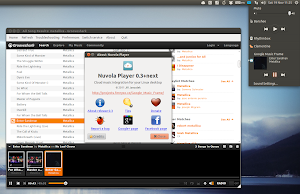 Google Music Frame used to be an application that integrates Google Music in Ubuntu, providing sound menu support, notifications, multimedia keys and even last.fm scrobbling. 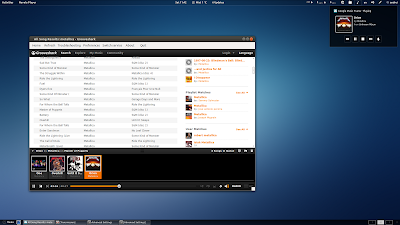 But the application has evolved and the latest development builds work with Grooveshark too. 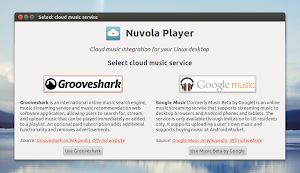 Because it now supports two music services (more cloud music services might be added in the future), Google Music Frame has been renamed to "Nuvola Player". Since the Grooveshark integration is very new, it doesn't support all the features that were available for Google Music yet: for instance, you can't use user scripts yet (so no last.fm scrobbling for now) Last.fm scrobbling support is actually built into Grooveshark now (as long as you log in). But there's something very cool about the Grooveshark support: because the website is embedded into the application, you don't need a Grooveshark paid subscription to use it (you don't even need to create an account if you don't want to)! Also, the Ubuntu Sound Menu / GNOME Shell Mediaplayer integration, multimedia keys or notifications already work for Grooveshark. 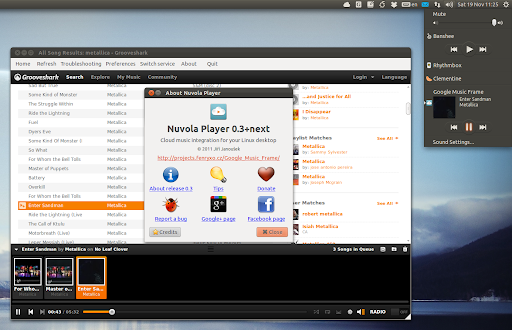 To install Nuvola / Google Music Frame in Fedora, see our previous post (note: not tested with the latest dev builds): How To Install Google Music Frame In Fedora.